​The American Delegation of Savoy Orders is one among 35 delegations of the Dynastic Orders of the Royal House of Savoy located throughout Europe, Japan, and the Americas. 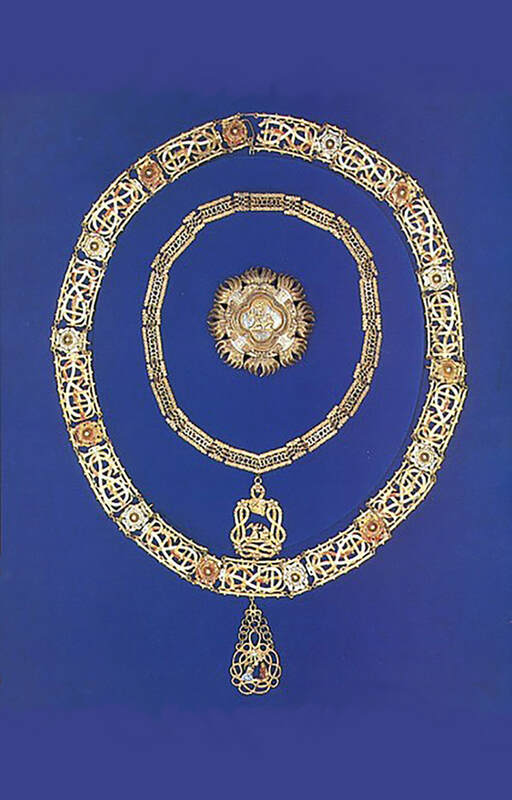 The Dynastic Orders of the Royal House of Savoy are among the oldest orders of chivalry in the world. 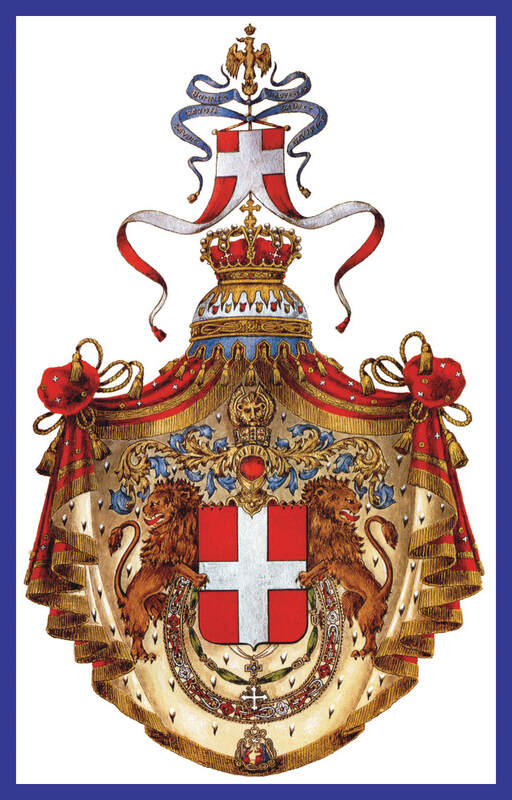 Their origins and their principles, traditions and humanitarian goals, like those of Royal House of Savoy that has the hereditary right to confer them, date back a thousand years. The Head of the House of Savoy and current Grand Master is H.R.H. Prince Victor Emmanuel of Savoy, Prince of Naples, who succeeded his father, the last king of Italy, Umberto II (1904-1983), who had succeeded his father King Victor Emmanuel III of Savoy (1869-1947). The hereditary crown prince is H.R.H. Prince Emmanuel Philibert of Savoy, Prince of Venice (1972). The Grand Chancellery of the Savoy Orders is in Geneva, Switzerland. Cav. Gr. Cr. Johannes Niederhauser, Grand Chancellor of the Savoy Orders; and Cav. Gr. Cr. Avv. Carl J. Morelli, American Delegate of the Savoy Orders. This web site is designed to provide information about the Savoy Dynasty, the Savoy Orders, its members, activities, news and recent events, as well as links to related sites on the Internet. 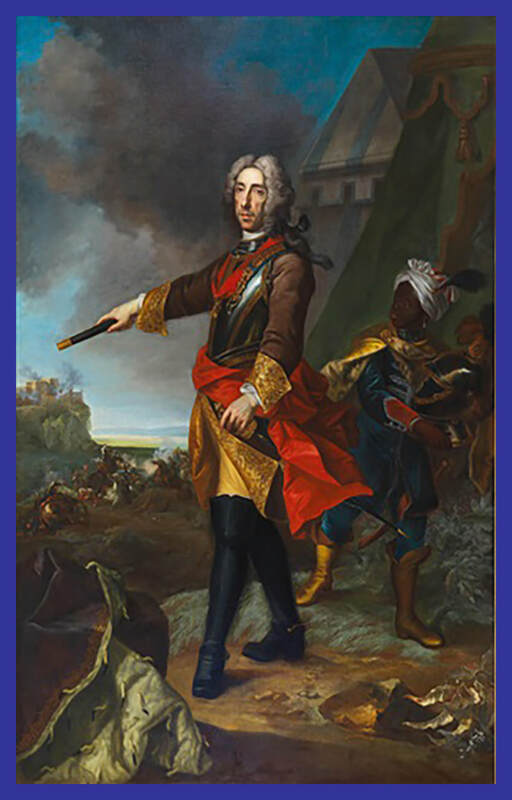 Inaugurated in 2003, it is the first web site in English to gather in one place the history of Savoy, the Savoy family, and the Savoy Orders of chivalry; as well as information about the activities and members of the Savoy Orders (please note, however, that the Members Page is password protected). It is a pleasure to welcome you to the official web site of the American Delegation of the Dynastic Orders of the House of Savoy. I trust that all who avail themselves of this site will find its contents informative and useful. In addition to this being the first official English language resource for information about the Savoy Orders, it will also contain communications issued by the Royal Institute of the House of Savoy and by other Delegations of the Savoy Orders around the world. I encourage you to visit the site often, and I hope that you will enjoy it. ​As Grand Master of the Savoy Orders it is particularly important to me that through this medium you will be able to learn about the history of my family, the Savoy Orders, and the activities being undertaken by the American Delegation. It is by understanding our common heritage and traditions that we are able to best serve our fellow citizens of the world through humanitarian works and public service. As Grand Chancellor of the Savoy Orders I, too, am pleased to welcome you to the official website of the American Delegation. This important Delegation has taken a leadership role in this respect, and I am delighted to know that its members and the English speaking people around the world will now have access to so much important information about Savoy history, about our Orders, and about the philanthropic activities we have all worked hard to promote. I want to commend the enthusiasm and energy that have been displayed by the members of the American Delegation who have made this website possible. Without their tireless efforts none of this could have been achieved. I feel sure that as the site grows and develops it will serve to enhance our ability to reach an ever growing number of people, not only in America, but also in other parts of the world. I am happy to introduce you to the official website of the American Delegation of Savoy Orders. It is my honor to serve as Delegate of H.R.H. Prince Victor Emmanuel of Savoy to represent the Dynastic Orders of the House of Savoy in the United States of America and Canada. 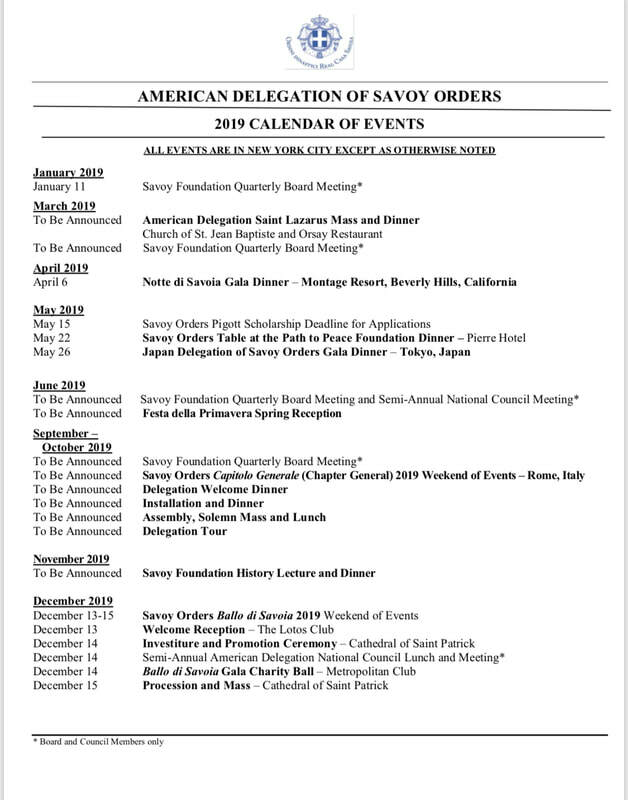 The Delegate's duties are to administer the affairs of the Savoy Orders in North America, act as liaison with the Chancellery of the Savoy Orders in Geneva, Switzerland, and to cooperate with the charitable and humanitarian efforts of the American Foundation of Savoy Orders, Incorporated, an independent New York 501(c)(3) tax exempt organization. I hope that through the abundance of information you will find in our website you will come to know more about the ancient principles, purposes and history of the Savoy Orders and their philanthropic mission in the modern world. I am grateful to Their Royal Highnesses for the enduring support and encouragement which they have given to me, and I am also thankful to the many members of the American Delegation who have given so generously of their time and talent to help create this website. We intend to keep its contents up to date, and to improve it at every opportunity. I hope that you will find it easy to navigate, and I would welcome your comments and suggestions for ways to improve and expand it. The American Foundation of Savoy Orders' second annual Notte di Savoia was held in Los Angeles, California on Saturday, April 6, 2019 at the Montage Beverly Hills. His Royal Highness Emanuele Filiberto di Savoia, Prince of Venice, Prince of Piedmont, was the guest of honor at this very special evening to benefit the Savoy Foundation's humanitarian and charitable giving initiatives, particularly Caterina's Club, which provides access to nutritional food, stable housing and job training for youth. Please review the 2019 Notte di Savoia press release. The American Delegation of Savoy Orders is part of the International Association of Dames and Knights of the Royal House of Savoy. The Dynastic Orders of the Royal House of Savoy are historically dedicated to works of charity. While deeply rooted in the past, the Savoy Orders are actively engaged in the challenges of modern society. Activities of the American Delegation include financial support of the fundraising charitable, humanitarian, cultural and education events of the American Foundation of Savoy Orders, Incorporated, a 501(c) 3 registered charity. The American Delegation also organizes and participates in social activities and events nationally and internationally throughout the year. On a national level, each year the Savoy Orders sponsor a number of social activities, anniversary observances and religious services. 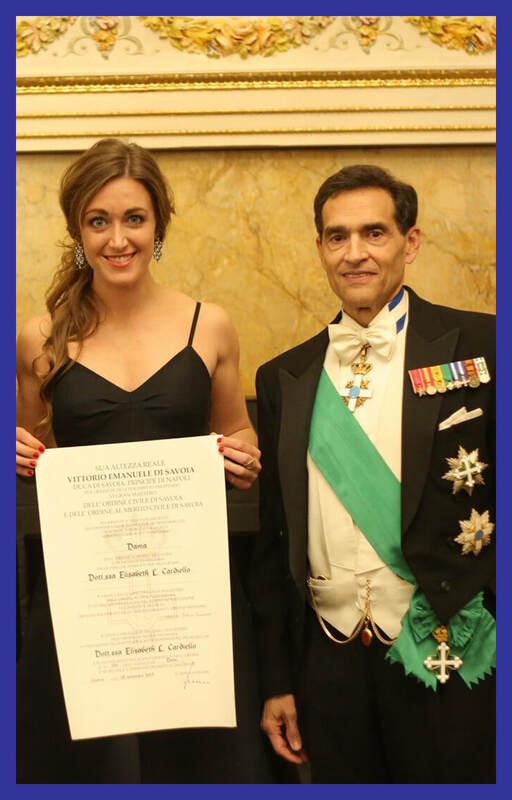 Activities of the American Delegation include financial support of the fundraising charitable, humanitarian, cultural and educational events of the American Foundation of Savoy Orders, Incorporated. The Delegation also arranges for the Knights and Dames of the Savoy Orders to attend the celebration of Masses during the year: a commemorative Mass and dinner for St. Lazarus Day in February or March and an Investiture Ceremony and Mass in December in conjunction with the Savoy Foundation's annual winter reception and gala dinner dance, Ballo di Savoia. General) of the Savoy Orders, usually held each year in Geneva, Switzerland or in Rome, Italy. Preceding the formal investiture ceremonies, the American Delegate welcomes the American members, candidates and their families and friends at a private welcome dinner at a local restaurant or private club. The next day, a formal installation ceremony is presided over by H.R.H. Prince Victor Emmanuel of Savoy, the Grand Master, together with the Grand Chancellor of the Savoy Orders and members of the Royal Family. On this occasion, diplomas and insignia are presented to the new members and newly promoted members of the Savoy Orders. The same evening, a formal benefit gala dinner raises funds for the international charitable works of the Savoy Orders. The following day there is a solemn Mass and procession of Knights and Dames in their church robes, followed by a benefit luncheon.